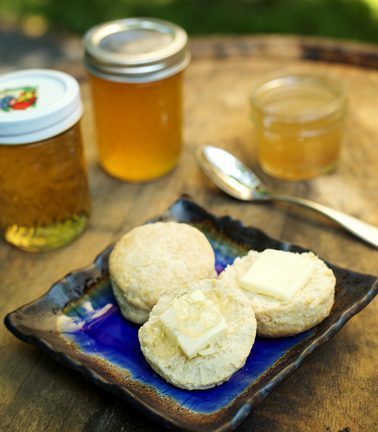 Bourbon that evaporates while aging in barrels is known as the “angel’s share,” and these biscuits experience that same phenomenon with the alcohol evaporating during baking, leaving a trace of sweet, bourbon-y flavor behind. Eat the biscuits hot from the oven with butter and honey or build a biscuit sandwich with a few slices of country ham and a goodly squeeze of spicy mustard. Preheat the oven to 400 degrees F. Mix the warm water and honey together and dissolve the yeast in the water-honey mixture. In a separate bowl, mix the flour, baking soda, baking powder and salt. Add the butter and shortening and mix with a pastry blender until the mixture resembles fine cornmeal. Preserve the flavor of peak-season apricots with this tangy shrub from Putney Farm.